In this study, the mesh selectivity of monofilament trammel nets used in catch of gilt head bream (Sparus aurata) was investigated using four different mesh sizes (28, 30, 32 and 34mm). Fishing trials were carried out in ?skenderun Bay from February 2005 to May 2006. 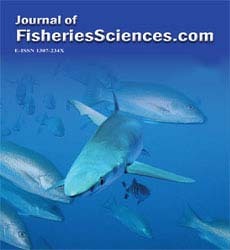 Selectivity on Sparus aurata was assessed using the SELECT method (Millar, 1992), implemented in the GILLNET software. Five different functional models; normal location, normal scale, gamma, log-normal and bi-modal were used to fit the selectivity curve to the catch data. It was shown that the bi-modal function was the best to fit the data. For the selectivity curves on the bimodal, the optimum lengths (100% retention probability for the 28, 30, 32 and 34mm mesh sizes) were obtained as 17.49cm, 18.74cm, 19.99cm and 21.24cm, respectively. Thus, considering the minimum allowable landing size (17cm), 28, 30, 32 and 34mm mesh sizes do not cause an over fishing on gilt head bream stocks in Iskenderun Bay, Turkey.